Healthy Khakhra Recipes. Crunchy, munchy, flavoursome…these are a few words that best describe khakhras! Keeping some khakhras ready on hand can be very handy on a busy morning, when you do not even have time to make or for that matter, even sit and eat a breakfast. Just grab a few khakhras from the box and munch on them on-the-go! This can double up as a really nutritious breakfast option, as it is roasted and can be reinforced with various ingredients for additional flavour and nutrition. All you need is to master the art of rolling them as thinly as possible, and you are all set to prepare these delicious khakhras at home with ease! We have a collection of healthy khakhra recipes made with 7 different healthy flours. Bajra flour, Ragi flour, Whole wheat flour, Jowar flour, Quinoa flour and Rajgira flour. Always avoid store bought khakhras as its easy to make your healthy khakhra recipes at home in advance and store them. Whole wheat flour khakhra recipes are healthy. Whole wheat flour is excellent for diabetics as they will not shoot up your blood sugar levels as they are a low GI food.Whole wheat flour is rich in Phosphorus which is a major mineral which works closely with calcium to build our bones. Hence we love using whole wheat flour in these healthy khakhra recipes. We have the basic whole wheat khakhra recipe, a famous Gujarati dry snack made from whole wheat flour, salt, oil and water. If you want your khakhra spicier, then opt for the masala khakhra recipe made from sesame seeds and chilli powder. I love to have this with some homemade curds using cows milk or low fat curds. Oats in healthy khakhara recipes. See why we love oats. Oats are a great source of protein for vegetarians. It is rich in soluble fibre (to make it good for diabetics), which helps lower blood LDL cholesterol, the so-called "Bad" cholesterol. Whole oats have an antioxidant called Avenanthramide (a polyphenol from oats) which helps lower blood pressure levels. Mini oats kahakra recipe provides the protein for kids and keeps them away from processed foods. These crisp and tasty Oats and Methi Multiflour Khakhras recipe are full of iron-rich ingredients like fenugreek, jowar and nachni, which not only contribute iron to the recipe, but also improve the flavour and texture of the khakhra remarkably. Why bajra flour is used to make healthy khakhras? Let's see why bajra is used to make healthy khakhras. Bajra flour is high in protein and is a complete protein for vegetarians when combined with dal. So as a vegetarian, include bajra in your diet. Bajra is a great option for those on a gluten free diet. Bajra is rich in Magnesium which improves insulin response by lowering insulin resistance which is good for Diabetics and healthy heart. We have the basic bajra khakhra recipe which is subtly flavoured with ginger-garlic paste, green chillies, sesame seeds, turmeric powder, oil and salt. 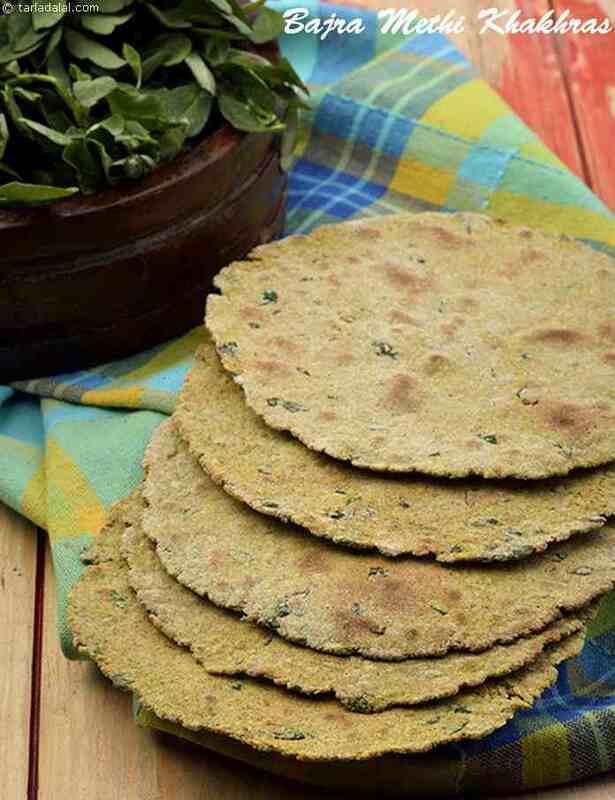 Wholesome bajra methi khakhra recipe made of bajra and whole wheat flour perked up with fenugreek leaves, green chilli paste and so on is a perfect accompaniment for tea. The bitterness of methi is surprisingly very pleasant in this creation. Why Quinoa flour is used to make healthy khakhras? See why we love quinoa. Quinoa is a super grain lowers cholesterol and reduces heart diseases. The soluble fibre in this grain gains the credit of reducing the total blood cholesterol and LDL (bad cholesterol) levels in our body. Harnessed with nutrients like protein, calcium, phosphorus and magnesium, quinoa has been considered as the bone-building power grain. Quinoa red chawli leaves khakhra recipe is a healthy and tasty khakhra that’s mind-bogglingly unique. Made of a mix of flours including quinoa flour and oats flour, this khakhra is fortified with red chawli leaves, sesame seeds and other flavour-enhancing ingredients. Similarly, you cna pair up quinoa with kale leaves to make healthy quinoa kale khakhra. Enjoy our Healthy Khakhra Recipes and other healthy breakfast articles below. Get an instant energy boost with these bajra and methi khakhras, the ideal anytime-snack! when you're feeling peckish or looking for a healthy breakfast option, reach for these crisp and tasty khakhras.